I looked under “boys,” and didn’t see Dora there. It struck me as odd, because Dora is a show that appeals to kids of both genders. 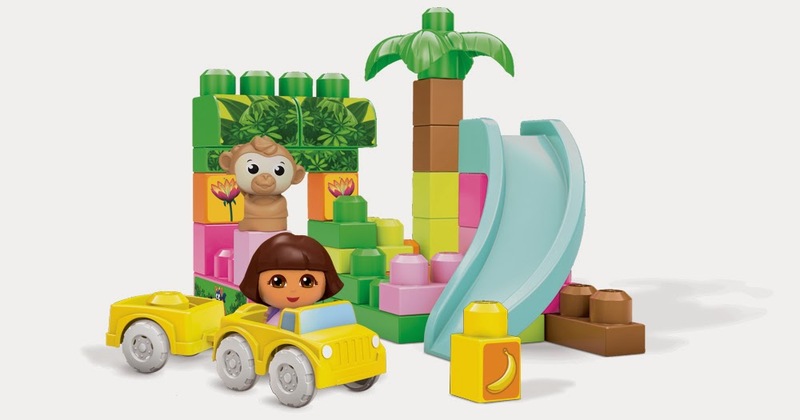 Then I started to think about Go Diego Go, which of course was the “boy-friendly” spin off. My kids watched a lot of Dora, but not very much Diego. 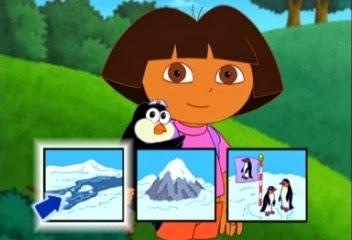 Using Dora as a jumping-off place, I found myself wondering what the main character line up of kids’ shows looks like. I will present you with my “exhaustive” analysis of Disney Junior, Nick, Jr., and PBS Kids. I will break this into many posts over the next month or so. I may also tackle NickToons and the Cartoon Network. For today’s post, I will focus on Disney Junior. I am basing my analysis on their list of shows found on the “For Grown-Ups” site. First up, Mickey Mouse Clubhouse. In this clip about super powers, Mickey gets two powers: flight and super strength. Goofy becomes super stretchy, Donald is very fast, Daisy moves things with her mind, Pluto can fly and can do dog stuff on steroids. And Minnie? She can throw wonder bows. What does that even mean? Also, while everyone sings and demonstrates their skills, Minnie sings briefly about hers (and her song is really just tacked onto Daisy’s), does not demonstrate it a second time, and then has the back up, cheerleader role for Mickey. Ugh. Daisy’s is cool, but all the boys get powers that allow them to move and burn energy and show strength, while the girls get powers that are less physical. Daisy uses her mind, and Minnie throws. I guess it is good that they don’t have to run though, since each female super hero has to wear high heels. 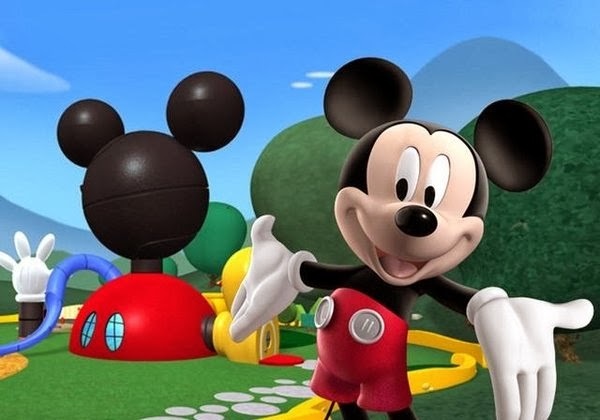 Mickey Mouse Clubhouse appears to be a dude-world. There are three boys and two girls. Plus Pluto, who is also a boy, but less anthropomorphized. Oh wait, and the professor, also a dude, who really makes me miss Ms. Frizzle. Mickey is definitely the main character of the show. Next up, Jake and the Never Land Pirates. Jake, who is obviously a boy, is the main character. He has a female side kick. You can tell she is female because of her long hair and visible eyelashes. She actually gets to talk and be smart though. I am watching this clip, and caught the weird thing where the characters instill heteronormative values onto animals, “somewhere, there must be a mom and dad missing their egg.” This assumes that the egg has a mother and a father that stick around until the hatching. Okay, when they are deciding to go off on an adventure, they have a role call: Jake has his sword! Cubby has his map!! And Izzy has…. pixie dust. Yep, that is right, pixie dust that was given to her by a fairy.I have nothing against pixie dust or fairies, but she couldn’t have a tool that exists in the real world? It can be used to fly, but only in emergencies. So, she can’t even use it at will. The other two get to use theirs as often as they would like. Her tool is limited. Jake is mostly dude-world as well. There are three in the crew, and two are male. The parrot is male, the villains are male. According to the Wikipedia page, there is a female mermaid, who is sweet and gentle. The mermaid is friends with Izzy and might have a crush on Jake (really!?) Izzy gets a lot of air time, but the show is named after Jake, and he is the leader. Third on the list is Doc McStuffins. Yay!! She is a girl! And a doctor! Oh but wait, not a doctor for real animals or people, but for toys. So, the girl is very obviously in the pretend world. Which is okay, but Jake was being chased by a real pirate. Like, he is a kid in a grown up role, not just playing a grownup. Her instruments were given to her by her mom, who is a doctor for people (and somehow the instruments are pink and purple). In this clip she is taking care of a fire truck, who apparently has a heart beat to check. ?? But, this has some really positive points. The little girl, her mom, and her dad are African American, and the mom is a doctor! And her dad is a stay-at-home dad!! That is a big deal. 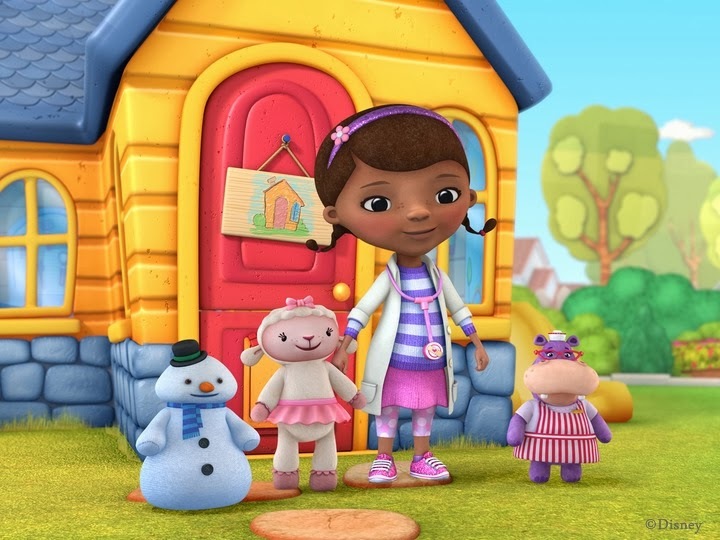 Doc McStuffins teaches her patients and audience about health, which is good. Doc McStuffins is a girl world. She is a girl, her reception is a girl, her mom is a woman. I haven’t watched much, but it looks like there is a good mix of male and female characters, and a girl is the main character. The show is named after her. OK, the main character is a girl. Most of the characters are girls. Her mom becomes queen by making the king a pair of slippers (woman with a job, cool), and then they fall in love and get married. Okay, really farfetched but okay. 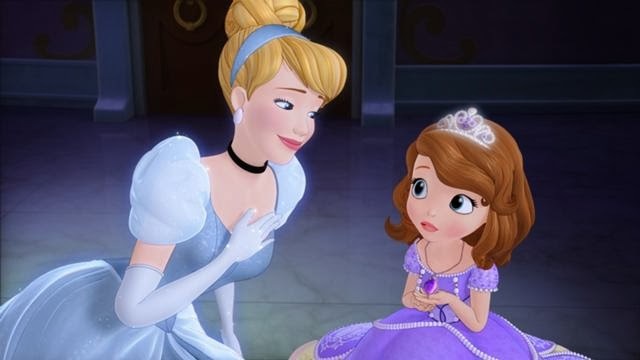 Main plot: Sofia learns that looking like a princess is easy but acting like a princess is difficult, because she has to show special qualities like honesty and kindness. This bothers me in so many ways. First of all, looking like a princess is easy? I don’t think that is a very good message to send young girls, especially given the prevalence of body dysmorphic disorder, eating disorders, and rampant consumerism in our country. “Looking like a princess” is incredibly difficult, if not impossible, for many girls and women. Attempting to do so can be costly and dangerous. And what does it even mean? What does a princess look like? Is there one model to follow? Also, this notion that acting like a princess is hard. Ugh. The vast majority of princesses are born into it. In order to act like a princess, they must simply be themselves. That is all. Kingdoms are not democracies, the people aren’t going to vote the princess out for crappy behavior. 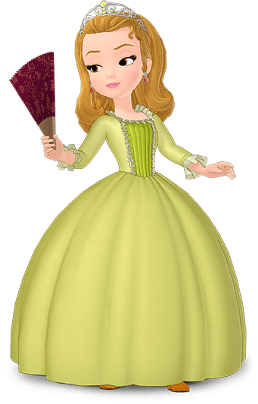 There is no single princess behavior guide, any more than there is one mode of princess dress. Furthermore, this perpetuates the idea that those who are royal and wealthy are better than everyone else. Since most people will not be either, I don’t think this is a healthy ideal to instill in our youngsters. And it feeds into the notion that girls do best when they are polite and graceful. Again, I don’t think those are the best values for 21st century girls who want to succeed in the world. Yes, they are important values, but the whole of society feeds girls these messages. Why do we need more of the same? Since this story is has been played out many, many times,no one reading will be surprised to learn that she has a step sister. However, of course exposure to the good and kind Sofia turns Princess Amber nicer and nicer. Because Sofia’s background in the working class has made her nice and a good role model? But wasn’t Disney just telling me that it is royalty who has these values? But the girl who grows up as royalty lacks these values and needs the poor kids to teach her? Ugh, I am so confused. 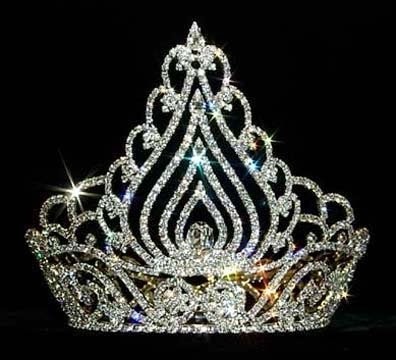 I guess I will just spend the evening shopping Amazon for the perfect tiara, because looking like a princess is easy. According to this clip, When a princess is in trouble her amulet summons another princess. It caused Princess Jasmine to just appear and know what was going on. I guess there is a special princess club that transcends time and space? I have gotten through three shows and I simply cannot go on tonight.